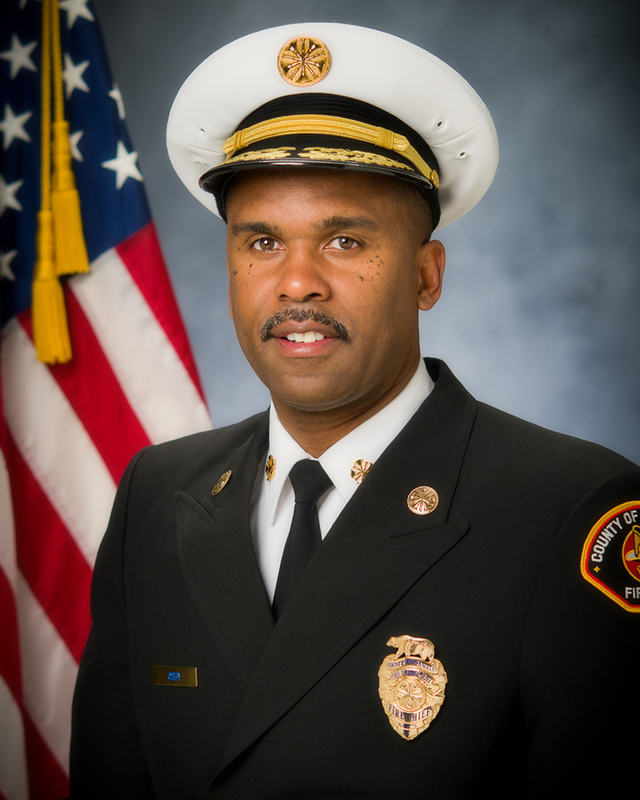 SCVHistory.com | Fire Fighting | Daryl L. Osby, Los Angeles County Fire Chief 2011-. [LACoFD 2015] — On February 17, 2011, Daryl L. Osby was sworn in by the Los Angeles County Board of Supervisors as the ninth Fire Chief of the Los Angeles County Fire Department. He has served as a member of the Los Angeles County Fire Department (LACoFD) for 29 years. He heads one of the largest emergency services agencies in the world, providing traditional fire and life safety services to more than 4.1 million residents and commercial business customers in 58 cities served by the Department, and all the unincorporated areas of the County within its 2,300-square-mile service delivery area. The Department operates out of 171 fire stations, including 4,800 emergency responders and business professionals operating on an annual budget of over $900 million. In addition, the County of Los Angeles Fire Department provides lifeguard, health hazardous materials, and forestry services throughout the County. He is affiliated with many fire service organizations, and previously served on the California State Board of Fire Services, and is a former member and chair of the Los Angeles County Emergency Preparedness Commission. Additionally, he is affiliated with several community organizations and has received numerous awards for his service. He is a former President of the Stentorians and Board member of the African American Firefighter Museum. He is an advocate for continuing education, and currently holds a Bachelor of Science Degree in Organizational Leadership from Azusa Pacific University. He is also a graduate of Harvard University's Senior Executives in State and Local Government and National Preparedness Leadership Programs, completed Clark Atlanta University's Executive Development Program and the Martin Gang Institute for Intergroup Relations at Loyola Marymount University. He is a California State Certified Incident Commander and Chief Officer.